The date of Le Marché aux poissons à Marseille has been widely disputed. In 1970 the painting was featured in an exhibition devoted to Raoul Dufy in Bordeaux as being executed in “1904–5” and two years later Maurice Laffaille dated it – together with the other three Marseille market scenes – to 1905. Ronald Pickvance, who studied the reverse of the painting in the Carmen Thyssen-Bornemisza Collection in 1997, noted that it retains a painted inscription: “Marseille 190(?)”. Pickvance thought it was “1903”, but lent more credence to the date “1905”. According to the English historian, although Le Marché aux poissons à Marseille displayed evident impressionistic traits – particularly in the style of execution – it also foreshadowed the freedom of fauvism, specifically in the pink awning on the right. Fanny Guillon-Laffaille, who also maintains 1905 as its date of execution, has spoken of the struggle in the painting between the contrasting light characteristic of nineteenth-century painting and the more modern contrasts of complementary colours. The latter contrasts are no doubt the basis for dating it to the later year. But more than fauvism, it seems to recall the work of Van Gogh, whose retrospective Dufy may have seen at the Galerie Bernheim-Jeune in March 1901 and whose famous Potato Eaters of 1885 most likely inspired his Theatre, Martigues (1903). 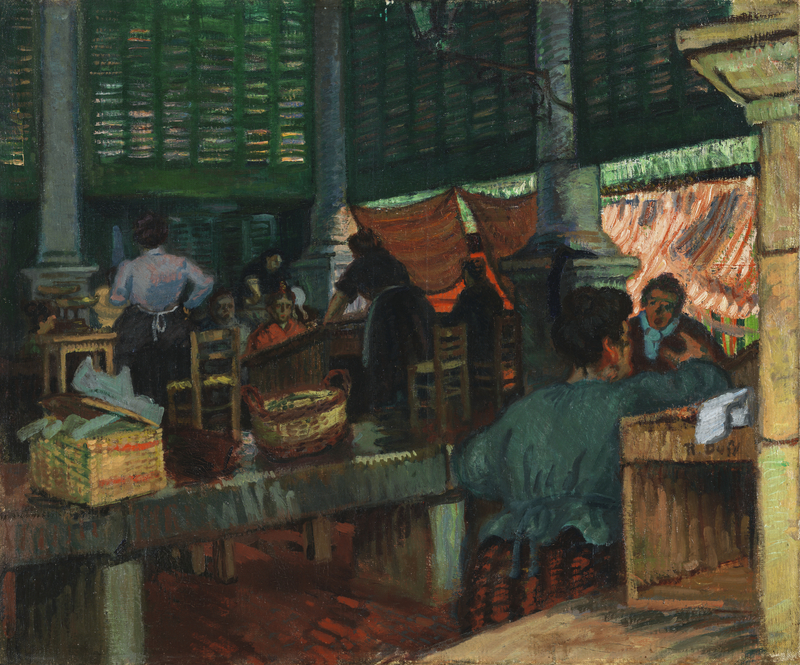 The historian Maïthé Vallès-Bled, who has recently ascribed Dufy’s series of Marseille markets to 1903, likewise underlines the strong influence of Van Gogh’s work found in it. In fact, the reminiscences of the Dutch painter in Le Marché aux poissons à Marseille are perceptible not only in the sharp contrast of reds and greens but also in the long, loaded brushstrokes of the crate in the foreground and, above all, the awning on the right. Moreover, the chosen theme – still indebted to nineteenth century naturalism – is more in line with Dufy’s initial work than that of 1905 (suffice it to remember that at the Salon of the Société des Artistes Français in 1901 Dufy had shown End of the Day, Le Havre, based on the local port workers’ strike). For the series of works devoted to Marseille market, Dufy may well have drawn inspiration from Léon-Augustin Lhermitte’s large composition Les Halles (1895). In fact, an early date is confirmed by a watercolour, its location now unknown, executed by Dufy and showing the same motif of the interior of the Marseille market of the Halle Delacroix, which bears the inscription “R. Dufy 1903 / Marseille”. A comparison between the two works is significant. The oil painting repeats the same photographic angle of vision, possibly influenced by Degas, but the figures have changed substantially. The stallholders in the middle ground are also identical, though the figure of a female vendor that Dufy does not seem to have satisfactorily captured has disappeared from the foreground. She is replaced by a frontally depicted housewife whose face is taken from another painting in the series – Le Marché à Marseille (1903) in the Petit Palais in Geneva – and a vendor with her back to the viewer whose pose recalls the woman in the foreground of Lhermitte’s abovementioned composition. But the most significant change is in the background of the composition, where the entrance to the market, previously open, is now closed by several awnings, allowing Dufy to accentuate the contrast between the vermilion and the chrome green. If any doubts still remain as to the date of the work in the Carmen Thyssen-Bornemisza Collection, recent studies have confirmed that there is no documentary evidence that Dufy travelled to the south of France in 1905, as previously believed.